Science fiction has long dreamed of turning Mars into a second Earth, a place where humans could live without having to put on a space suit. The easiest way to do that would be to use carbon dioxide already on Mars to create a new atmosphere, but now researchers say that is impossible. Terraforming Mars to make its surface habitable for Earth life would involve raising both its temperature and pressure by adding an atmosphere made of heat-trapping greenhouse gases. The only ones present on Mars in any significant amounts are carbon dioxide and water vapour, both of which are currently frozen. No, it turns out. 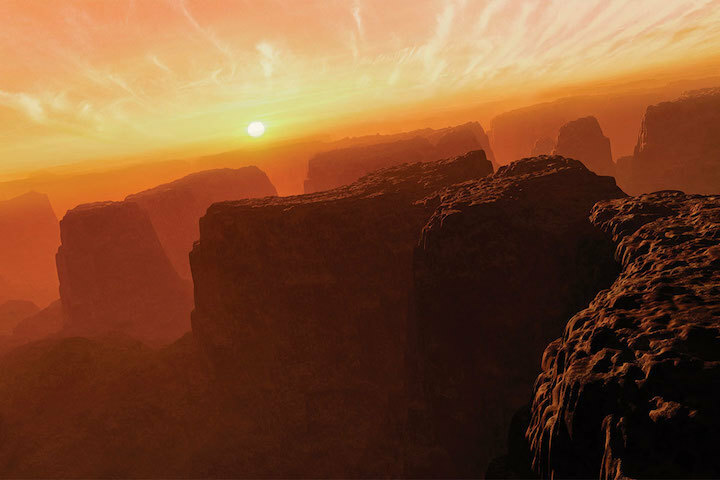 Bruce Jakosky at the University of Colorado, Boulder, and Christopher Edwards at Northern Arizona University used results from several spacecraft to build an inventory of all the carbon dioxide on Mars to figure out whether, if we moved all of it from the ground into the atmosphere, we could create high enough temperatures and pressures for life. Right now Mars has an atmospheric pressure of about six millibars – tiny compared to the one bar at sea level on Earth. “We would need something like a million ice cubes of carbon dioxide ice that are a thousand kilometres across in order to do get to one bar,” says Jakosky. At one bar, the temperature would be just above 0°C, allowing liquid water, and thus life, on the surface. The atmosphere wouldn’t be breathable, but humans could get by with breathing masks, not full space suits, and plants could grow freely, slowly building up oxygen over the course of the next few centuries. Without enough carbon, we would have to warm up Mars some other way, perhaps by making chlorofluorocarbons(CFCs) or bombarding the planet with comets or asteroids. That’s going to be difficult, and it will still not be enough to truly make Mars a home. For that, we need nitrogen – and we’re still not sure how much of that Mars has. Another source is CO2 attached to dust particles in Martian soil, which could be heated to release the gas. The researchers estimate that heating the soil could provide up to 4 percent of the needed pressure. A third source is carbon locked in mineral deposits. Using the recent NASA spacecraft observations of mineral deposits, the team estimates the most plausible amount will yield less than 5 percent of the required pressure, depending on how extensive deposits buried close to the surface may be. Just using the deposits near the surface would require extensive strip mining, and going after all the CO2attached to dust particles would require strip mining the entire planet to a depth of around 100 yards. Even CO2 trapped in water-ice molecule structures, should such “clathrates” exist on Mars, would likely contribute less than 5 percent of the required pressure, according to the team.